Totally Remodeled 1-Bedroom Condo with Fantastic Views with No Steps!! 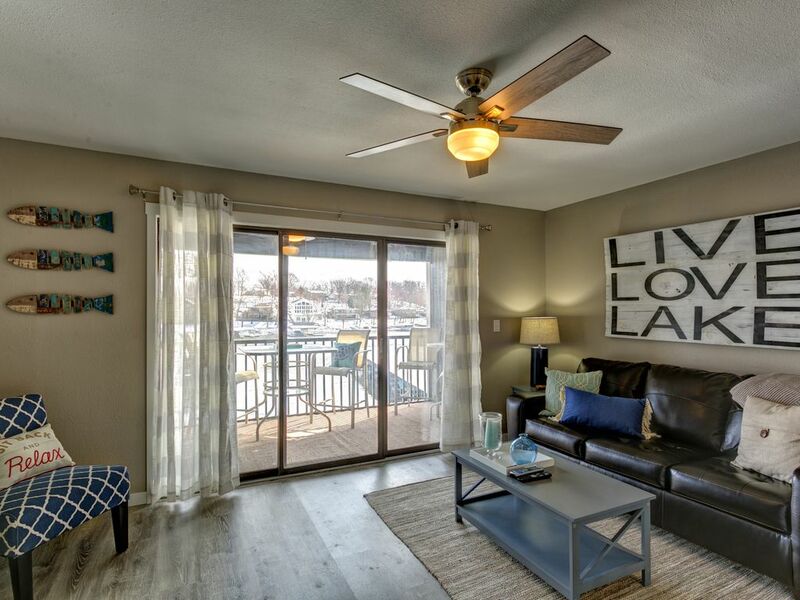 You’ll be delighted the minute you walk into our completely remodeled top floor water front, main channel view condo. The assigned parking spot directly in front of our condo with walk over make access to our unit a breeze. Did I mention there are no steps? Our condo is centrally located at a Harbor Point off Nichols Road in Osage Beach at the 21 mile marker of the main channel. We’re just around the corner from RedHead, Shorty Pants and Paradise by water and minutes from everything Osage Beach has to offer by land. Harbor Point has a lake front pool. Our unit was completely remodeled with brand new furnishings from top to bottom. It provides a light and bright atmosphere that has been newly furnished from top to bottom and decorated in a casual, comfortable, lake front living lifestyle. You will find a fully equipped kitchen with all the tools you need to prepare your family meals, drinks and snacks. Our unit is super clean with all the necessities, so you feel right at home. Our one bedroom is outfitted with a king size bed and the living room couch pulls out to a sleeper sofa for one child. Stepping out on the open-air deck with cove and main channel view outfitted with a grill and TV for watching the game. Our patio is East facing so no evening sun to deal with. ABSOLUTELY no partying! Must be 25 or older to rent and show proof of age! Our condo is also non-smoking and pet free. Max occupancy of 2 adults and 1 younger child. Our family has been coming to the lake for years and we always dreamed of having a place there. Thankfully in 2014 our dream came true and we purchased our first condo at Lands End at VRBO # 653363. We enjoyed that condo so much we purchased a second smaller 1 bedroom condo which is ideal for us. The complex offers great amenities from a lake front pool to onsite boat ramp and trailer parking. Many Boat Rentals very close. Lake front Patio with Grill and TV to catch the game. Lake of the Ozarks has over 20 golf courses to select from. My husband and I stayed for the weekend and it was a nice retreat. They really did a lot of Beautiful updates in the condo! The owners provided all instructions and ideas for nice restaurants close by. We hope to return again soon! It was everything we expected. The unit we stayed in was excellent. Everything we needed was available to us. It was a beautiful unit with a beautiful view. Would highly recommend it. The owner provided all the needed information we needed to have an excellent stay. Would definitely contact the owner again to see if this unit was available. Our stay was wonderful in spite of the weather. A screened deck allowed us to sit comfortably outside for an excellent view. The condo was decorated very cute and had everything we needed. My only complaint if I had any was the light outside the bedroom was very bright coming in through the blinds at night while trying to sleep. That’s minor with a great place like this. I would definitely come back here again. My husband and I have rented this condo several times now. It is always spotless and has everything we need. Josh is always very prompt and makes the rental process very simple. We especially enjoy the screened deck and quiet complex. We feel so lucky to have stayed at this beautiful condo right on the water. It was so easy and had everything we needed including condiments from jelly to mayo! It was nice not to have to buy those little things. I brought my three year old for Spring Break and one of his favorite activities was eating lunch on the deck looking out over the water. The whole deck is screened in so it was extra safe for my little guy. The condo was close to everything we wanted to do from hiking to cave exploring which was extra convenient when vacationing with a young child. A pleasant surprise was the exceptional playground at the elementary school down the road which we spent time at during our down time. The owners make it easy to get in and out and the parking spot was so ideal. It really was the perfect pick for our vacation. This condo is very clean and tastefully updated. We felt very at home here. The screened deck is wonderful. It has an amazing view of the main channel. This complex was very quiet and well maintained. It is centrally located to activities/events by car and boat. The owner was very prompt and thorough with the rental process. We enjoyed staying here. Rates, Open Dates and minimum night stays are all Subject to Change Without Notice. Once booked, Price is Locked in. Payment: Personal/Cashiers Checks Accepted, E-Check Through Homeaway to avoid CC fees ; Or Credit Card Payment Available Through Homeaway With A 2.9% Fee Must Be 25 Years Old, No Pets, No Indoor Smoking. Cancellation Policy: Cancel More Than 30 Days Prior To Arrival Date=Full Refund. Cancel More Than 14 Days To Arrival Date=50% Refund. Cancel Less Than 14 Days To Arrival Date=No Refund. Full Payment is Due 30 Days Prior to Arrival.